The four large Castlegate Quarter drawings produced with the aid of a YA Micro grant. Each drawing depicts a different aspect of the Castlegate Quarter of Sheffield. This marks a change in direction for the work. Moving away from studies of single buildings towards the much broader subject of a specific part or quarter of a city that is under change. A part of the grant was used to produce a new drawing using images gathered from an open submission of photographs by the public Information about A Picture of Sheffield can be found here. With a demonstration on Sunday by Peter Griffiths of the Castlegate drawings on Sunday 22, 12-3pm. 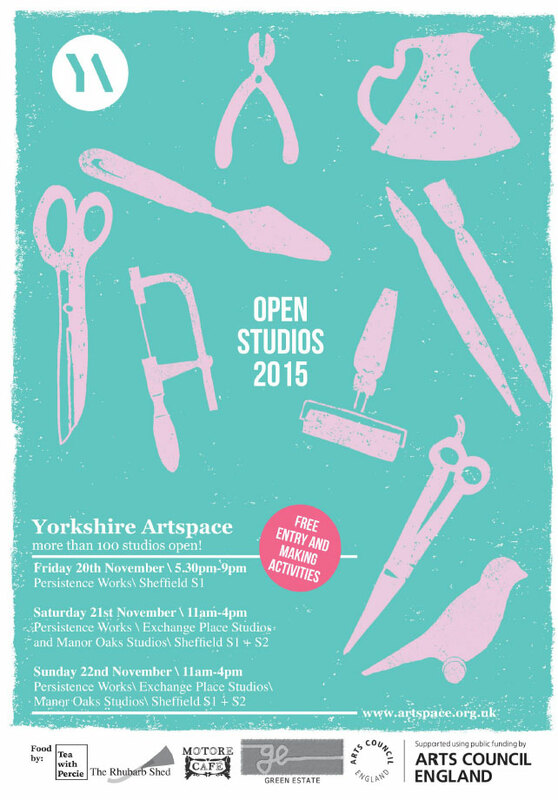 You can visit Peter Griffiths’ Studio on Friday and Saturday at the Persistence Works site, in Studio 9, on the ground floor. On Sunday the demonstration will include a display of the four large format drawings the have been produced of the Castlegate Quarter and a extra large format drawing of Sheffield. 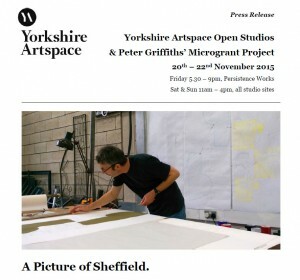 The large format drawing is being produced using photographic images submitted by the public of Sheffield Architecture. 50 A4 digital prints of the drawing will be given away on Sunday during the event. 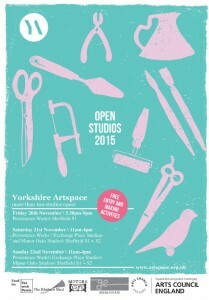 This event has been funded by a MicroGrant from Yorkshire Art Space find out more about this project here. Sheffield City landscape is changing rapidly, something that hasn’t gone unnoticed by local artist Peter Griffiths, a studio holder at Yorkshire Artspace. Quietly obsessed with Sheffield’s architecture, Griffiths has been producing drawings from photographs for the past four years, examining the readymade shapes, textures, patterns and forms of Sheffield’s topography. Griffiths was awarded a Microgrant earlier this year by Yorkshire Artspace to develop four large scale pencil-drawn collages of the architecture of Sheffield’s Castlegate area plus an additional collaborative work entitled A Picture of Sheffield. To develop the work, Griffiths issued a public call out for digital submissions of photos which capture the architecture of Sheffield. 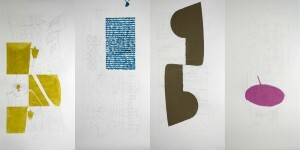 “I use photographs of the subject to provide readymade shapes, textures, patterns and forms which can be appropriated, rescaled and cropped into simple motifs and then collaged into a final image that in some way redefines the original subject. Thanks to everyone who has already sent in a photograph. Anybody planning to send one in needs to get a move on. It is getting close to the Yorkshire Artspace Open Studio Studio event so I will be closing photo submissions for the ‘Picture of Sheffield’ that I am creating. The cut off date is Sunday 8 November. So if you want to take part you need to submit a picture before then. I have started to collect images via public open submission. So a Big thank you for the people who have sent in images so far. If you want to submit a photograph and see what is happening just have a look here. A video of a video, how circular. But you can get a better feel for the video projection at the Castlegate Festival. I am quite pleased with how it comes across, Unfortunately I never got to see the actual projection as I was away from Sheffield at the time. Last week I finished a new public artwork which can be seen on Fitwilliam Street in Sheffield. It was commissioned by MAF Properties for their new student flats accommodation. It is a design etched onto the glass balustrade of the first floor and can be seen from the street. The design is abstract and based on a composition of curved arcs which cross and intersect while flowing across the nine glass panels. If you visit my Facebook page https://www.facebook.com/PeterGriffithsAppliedDesign You can find a coupon that gives you 10% off until the end of July. I have been commissioned to produce a design for an art work for a new building in Sheffield. A line Between is a video produced as part of my Yorkshire Artspace Micro Grant for the Castlegate Festival. The video is an animated slide show made out of photographic images taken during a walk around the area. A Line between 3 from Peter Griffiths on Vimeo. My intention was to explore the area and collect images. I was trying to get a feel for the area, get to know it better and decide how I would use the architecture of the Castlegate quarter to produce one of my digital drawings.